WOLVES: Ikeme; Iorfa, Batth (c), Ebanks-Landell, Doherty; McDonald, Price, Byrne, Henry, Graham; Afobe. SUBS: McCarey, Golbourne, Edwards, Wallace, Coady, Holt, Le Fondre. Kenny says Wolves need to keep their attacking threat but be more resilient defensively. Goals conceded are sapping the confidence. Kenny very disappointed to see Wolves fall away after a good start. Defensively poor as a unit to concede 7 goals in 2 games. Big thank you to the 907 Wolves fans that made the trip up to Hillsborough this afternoon. Have a safe trip home. Thanks for your company folks at a very disappointing day. Hope you have a great Christmas. Back for Reading on Boxing Day. 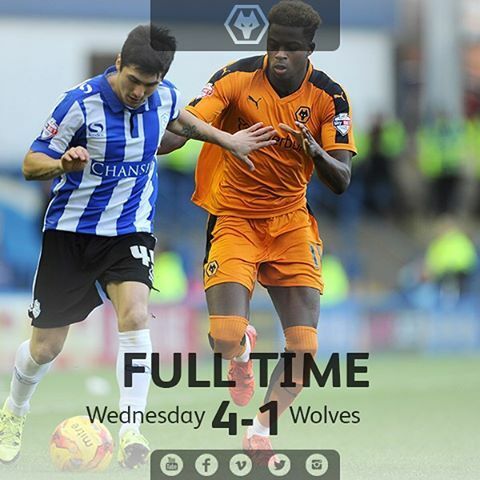 F/T Sheffield Wednesday 4-1 Wolves: Forestieri (2), Pudil and Hooper goals overturn Afobe's opener & condemn Wolves to defeat at Wednesday. 90+3' Gary Hooper with a golden chance to make it five. Brings down a Barry Bannan pass but misfires in front of goal. GET PEARSON IN NOW! H WILL SHAKE EVERYTHING UP! We are in trouble need some inspiration, onwards and upwards. I dont think so davo no shots on target all second half or is that just no shots? 90' Atdhe Nuhiu dispossesses McDonald, breaks forward and picks out Gary Hooper who finishes past Ikeme one-on-one. DISGRACEFUL. THEY SHOULD BE ASHAMED OF THEMSELVES!!!!!!!! Holt on the pitch,that just about says it all ! Now its just a matter of finding a way to survive,no dedicated owner, a manager long since lost in the ozone,young players losing faith in themselves every minute at the moment and a director without any good plans for the future it seems, its gonna be a really tough 2016. But i believe this great old club will rise again. SO HAVE A MERRY OLD GOLD CHRISTMAS !